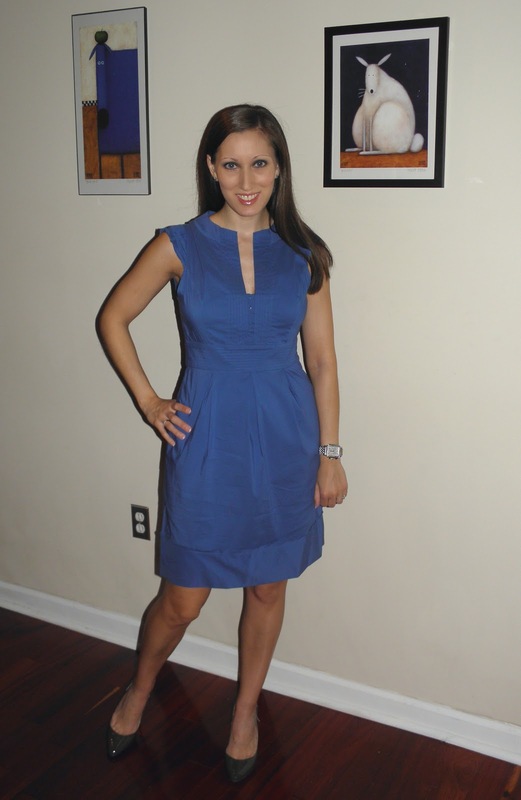 With the weather continuing to be Spring-like here in Atlanta, today I'm in another casual Springtime outfit: BCBGMaxAzria's sapphire blue dress with Jimmy Choo Izzy pumps. I love the cut and style of this dress, as it cinches in at the waist but is very loose in the hips, and is thus slimming. Although the material does wrinkle easily, this dress is easily a favorite of mine, and I don't think I've worn it in a while, so thank you Fashion Challenge. Jewel-tone colors have been dominating fashion for the last few years, and I, for one, am thankful. I love ruby, sapphire, amethyst and emerald colored clothes, because no matter what your complexion or body type, these colors definitely breathe some life into your wardrobe. I especially loved the gorgeous emerald dress that Angelina Jolie wore to the Golden Globes in January. It was just fabulous! With a blue, you can also wear a myriad of different shoe color options, although I tend toward wearing blue with brown or camel colored shoes. These Jimmy Choo Izzy pumps are a mud color, so I think they work great. Pointy-toe pumps are also a trend that seems to be coming back in style this season. Stay tuned!